May is the month to celebrate mom… so it seemed the perfect time to announce our new Mama Mornings at the Bungalow! Jess Arnaudin is an esthetician of 7 years and new mama herself. What inspired Mama Mornings at the Bungalow? Recently becoming a mother was one of the most beautiful yet difficult life transitions I’ve ever experienced. It was an enormous identity shift… one that I’m still exploring and learning from every day. One of the biggest changes was that I was no longer responsible for myself, but rather, a tiny miracle human who needed me round-the-clock. Never have I given so much of myself, mind, body and spirit. There were so many days where I wished I could go somewhere with my baby, somewhere other than music class, or the library, or a public park. But somewhere cool, somewhere replenishing, somewhere for me — where she was also welcomed with open arms. So there I was, sitting in the salon chair feeding her cheesy bunnies like a crazed madwoman trying to stifle her every sound. I left feeling more significantly more stressed than when I started, not to mention downright discouraged. From that moment a seed of an idea was born. 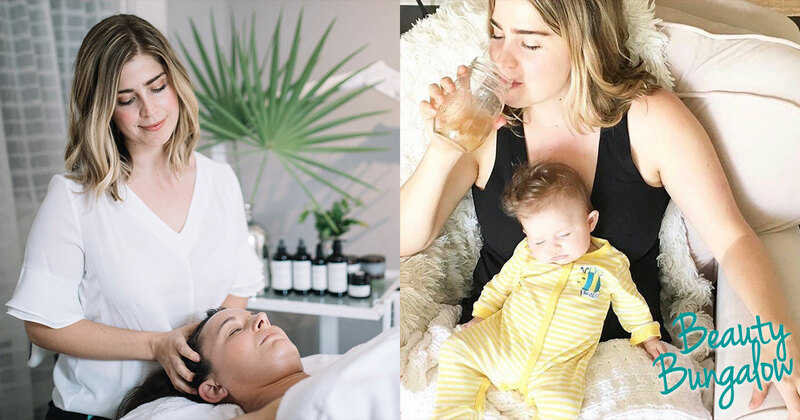 To create a welcoming, healing space where we could focus on straightforward express beauty services for moms with babies… And that’s how Mama Mornings at the Bungalow began! We’ve condensed some of our most popular treatments into 30-35 minute sessions customized around what is most needed that particular day. Some options are microdermabrasion, oxygen therapy, enzyme peel, gua sha massage and brow shaping. These targeted treatments are ideal for pressing skin issues such as breakouts, dull skin and tired eyes. What can a mama and baby duo expect? Let’s keep things simple and go with the flow. We have a plush rug on the floor in the treatment room where babes can do tummy time next to you while you’re having the service. I’ll welcome nursing during treatments and encourage you to bring snacks, books or quiet toys to keep your little one stimulated. We won’t use the steamer in the room and I’ll do some basic baby proofing each day before the first session. Small children are unpredictable and they are often loud… let’s just honor their feelings, engage with them, and see how it goes! For now, Mama Mornings appointments are available every Thursday morning at 8:30 am and 9:15 am time slots. We’ll wrap up before 10 am when we *officially* open for business! Sessions include all array of treatment choices. Call to book as these are a specialty booking option!